Within two days we will teach you the basics of pad printing to ensure that you have the knowhow to achieve the best printing results. And also after the course we are very happy to support you with our professional expertise and advice. 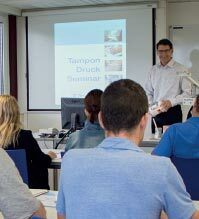 In our course room you will gain fundamental insight into the pad printing process. After the training you will have the knowledge needed to optimise the workflow and avoid mistakes. Theoretical contents with practical examples shall be accompanied by hands-on demonstrations and exercises. Prices are including lunch and course documents, excl. VAT. The number of participants per course is limited of 10 persons. Here you will find the registration form. phone +41 52 645 20 00.